A quick look at some of the reasons to purchase one of our ALL STEEL Carports, Triple Carports, Garages, or Workshops. 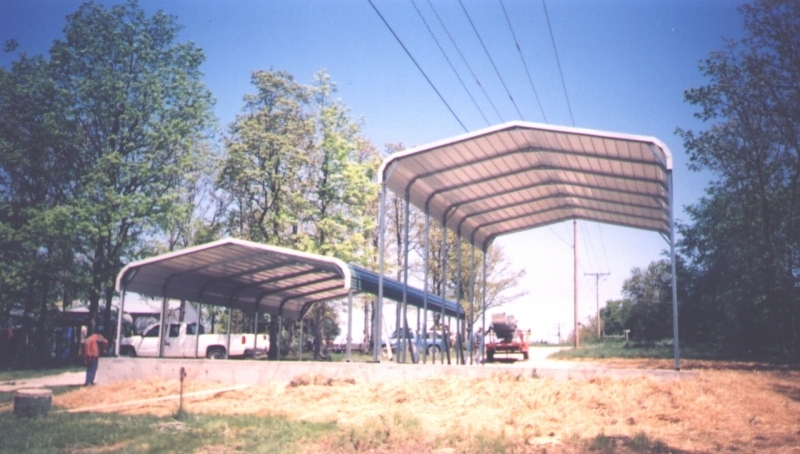 Our Carports and steel buildings are SECOND TO NONE, and truly have a wide variety of uses. Since 1999 our metal buildings have been used for residential, agricultural, commercial and industrial applications all over the continental US, with the exception of a couple of states that we don’t service. All of the illustrations listed on these pages are simply samples. We do not have a model per se because everyone wants a Carport, or Steel Building tailored to their own specific application. 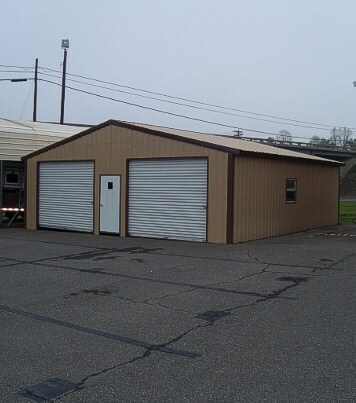 Therefore, we can build a steel building that fits your needs exactly whatever they may be. You will not find a more economical means for any of your storage needs. From our basic 12’x21’x5’ Carport, to our 40’ wide Open Span Buildings, I think you’ll agree that the cost per square foot is very reasonable. Configure it the way you want it. Leave it open, close the sides, 1 end, close both ends and build a garage. If you need it we will do our very best to meet, even exceed all of your expectations. We have been covering the Midwest with steel since 1999, and have 1000’s of satisfied customers. Our most frequently asked question is, "Does the price include delivery, anchoring and installation within the normal service area?" The answer is yes. The prices on the following pages include delivery, anchoring and installation on your level site in our normal service area in the states of , IL, Illinois, IN, Indiana, IA, Iowa, KS Kansas, Missouri, Ne, Nebraska, OK, Oklahoma, AR, Arkansas. However, we service 45 contiguous states. Price differences do occur due to different code requirements for snow, and wind loads in different parts of the country. How long does it take before my Carport, or Garage will be installed on my site after I place my order? Normal installation is within 1-4 weeks depending on the workload in your area. However, many factors can come in to play. Your order is sent to the scheduling department where it is placed on an install list by your zip code, once enough orders are received for a “run”, you will be called with an installation date. If an unforeseen circumstance should arise, and you call us to place a hold order on your Carport, or Steel Building, for any reason, when the hold order is lifted, your order will be sent back to scheduling, and your wait time will again be 1-4 weeks additional. Are the prices on these pages current? Yes, they are. We do try to keep these pages updated, but prices are subject to change without notice. Can I have my Building custom sized; I don't see the size I need! Yes. For example you may need a garage that is 21′ wide x 27′ long. We will make it that size. To determine the cost – it would be the exact same cost as the next larger standard size. This formula would apply in every circumstance. Does a color choice for my metal building add to the price? No, you may choose one color for the roof, a different color for the trim, a different color for the sides at no additional charge. You may also choose to make all of the colors the same on your structure, it’s yours so make it what you want. Can I buy the materials and assemble my Carport, or Building myself? Yes. However, you will only receive a 5% discount. We still must pay our installers to sort, load, deliver, and unload your material. All materials will be delivered to your home. You may pick up the materials at the manufacturing facility closest to you, however no assembly instructions are provided. When you pick up the materials, you will receive a 5% discount on the material. Bear in mind that none of the metal is precut, and you receive no warranty on self installed units. This is your choice if you decide to purchase and assemble yourself (not our recommendation). Do I have to pay sales tax for my garage? Unless you are purchasing a garage for the federal government, state government, have a farm or agricultural exemption, have a sales tax exemption number, and are willing to sign a sales tax exemption form, you have to pay sales tax, or live in a state that is free of sales tax. What factors may add to the cost of my Building? a. If the garage is to be installed over an existing structure, there is a minimum additional charge of $200. b . Installation on an elevated retaining wall – fees assessed on a case-by-case basis (photos of the site must be submitted before order approval). Is there a discount if I purchase more than one structure? What are the financial terms to purchase a Carport? 10% deposit usually paid with a credit card, or check is required. The balance being due after your Carport orBuilding is installed. Yes. At this time we offer financing through 2 different finance companies. Personal Finance Co., and SpringLeaf Financial, or financing may be secured through your own bank, or finance company. All purchases require a 10% deposit. All deposits are not refundable. What are my payment options for the purchase of a metal building? We are able to accept payment for you deposit right over the phone using our safe, and secure credit/debit card processing. Our verified PayPal payment gateway, through which you may use your own PayPal account, debit, or credit card – Visa, American Express, MasterCard, Discover, personal, or business check, cash, money order. How do I order a metal building or workshop? We prefer to handle the ordering process with you ourselves to ensure all of your questions are answered, and the proper options are chosen for construction of your new Carport or Building. You may call us to place your order, and we’ll be happy to help you put together a package that fits your needs, or stop by our shop to place your order in person. What happens after I approve my order and place my deposit on a Structure online? Once we receive your deposit, whether online or through the mail, we will forward your order to scheduling to be placed on the list for installation. Our scheduling department will contact you approximately 3-4 days before installation, at which time an appointment will be made for our installers to construct your structure. Installation appointments not kept will result in a return fee of no less than $100 and will result in your order being placed back on the install list with the possibility of a 3-4 week delay. We have 13 different colors from which to choose. (see chart below.) 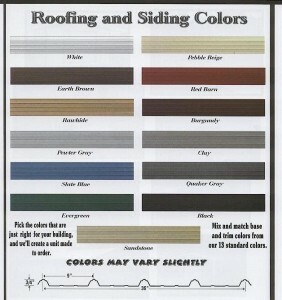 You may choose one color for the roof, a different color for the trim, a different color for the sides at no additional charge. What is the warranty on the steel garages, and Buildings? 14 gauge Structures come with a 30 day workmanship warranty. What is the gauge and size of the metal frame and sheet metal used for my Carport? 29 gauge steel Ribbed panels in 13 different colors. What if my ground is not level where I want to place my metal garage? 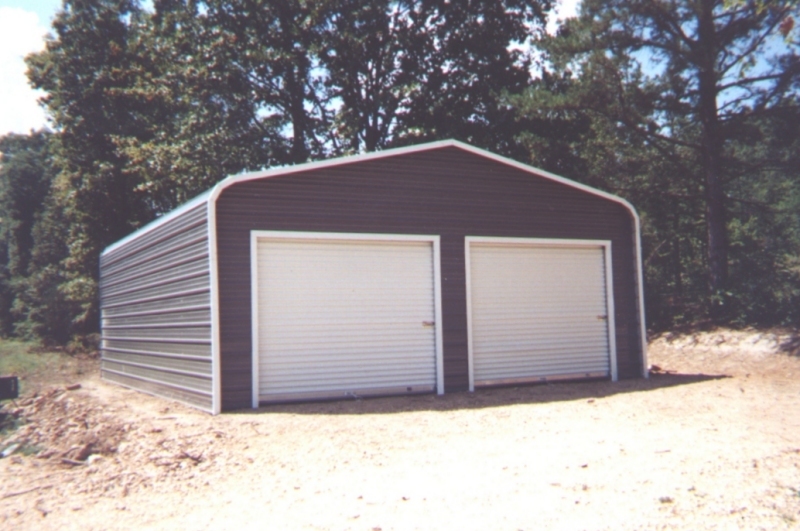 We’ll build a Carport, Garage or any of our All Steel Buildings as long, or a short as you need it to be. Do I need a permit for my steel building? You may, depending on your local zoning regulations. Can your metal buildings be attached to my home/garage/other structure? No, we will not attach to other structures. With the exception of lean-to type structures, in which we will attach a lean-to to a customer installed board of the appropriate length for a lean-to fee of $100. Call our knowledgeable staff 7 days a week at 618-521-0159, and talk to a real person, or email us anytime. We have internet capabilities on our phone and pride ourselves on fast, friendly responses. Yes, as long as the boat dock is securely anchored to the shore line. What width Structure is good for 2 cars? Most people prefer a Structure width of at least 22′ wide for 2 cars, although some report that 20′ wide is sufficient. We do not, but spray foam seems to be the insulation of choice for this type structure. Am I responsible for the base rail sealing at the foundation of the Carport, or Garage, if necessary? Yes, it is the responsibility of the purchaser. Can I have the structure built now on the ground and pour concrete at a later date? Yes, that is possible, but certainly is not recommended. You end up with a much better floor finish, and appearance if the floor is poured and allowed to cure prior to installation. Your Carport is laid out base rails first, uprights and trusses screwed together, and stood up in order. 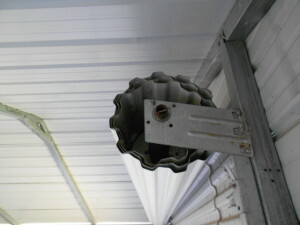 Roofpanels are attached in order from one end while maintaining the proper spacing between the uprights. After which the sides, ends, doors, etc, if purchased would be installed. Then trim is installed for a finished appearance. Remove anything out of the way that would impede the progress of the installation. Clearly mark the four corners of the location and level the spot if necessary. All Carports come standard with snow braces on each truss, and a knee brace at each corner where possible. Both are galvanized steel. However, the wall thickness of the 14ga. steel is 0.0745, while 12ga. framing is0.1083. The roof pitch of our Carports is determined by the width. and ranges from 4/12, to 5/12, and are constructed so as to meet predetermined snow load requirements for a particular width. What is the upright spacing? For 12′ to 24′ wide structures the post are spaced no more than every 5′ apart in our service area. Northern tier states require a closer upright spacing for increased snow load. For 26′ to 30′ wide structures the post are spaced no more than every 3′ 6″. Carports, depending on size can take anywhere from 1 hour for a 12’ wide, to 6-7 hours for 30’ wide. Garages and Barns can take anywhere from 1 – 2 days to assemble, depending on the options that were ordered and the size of the building. How close can I put this building to another structure, building or fence? There is no hard and fast rule. However, keep in mind the installers need 2′ of space to attach the sheet metal to the sides with their screw guns and set their ladders for taller structures. What leg height should I have for a garage? Although, there are exceptions, the rule of thumb is, if the garage doors are to be placed in the end (width) of the garage the leg height must be 1’ taller than the height of the garage door(s). If the garage door is to be placed in the side wall (length) of the garage, the leg height of the garage needs to be 2’ taller than the height of the garage door. Pour slab 3-4″ wider in width and the same length as the base rails.. As an example for a 24′ x 40′ garage a slab should be a minimum of 24′ 4″ x 40′ long. This allows installation of the concrete anchors without getting too close to the edge and possibly cracking the concrete. Will an electric garage door opener work with your roll-up steel 'coil' type doors? The roll-up steel ‘coil’ type doors work great but electric garage doors do not work with these. In situations where an electric garage door opener is required we recommend that you let us build the garage door with framed in openings that will accommodate the garage door(s) size of your choice. After your garage is completed you or a local garage door contractor can install a sectional raised panel garage door that an electric garage door opener will work with. What type of roof is best to have? Without a doubt the far superior vertical style roof. Why is it superior? A vertical style roof is far less prone to leak. The roof does not hold water, leaves, snow and other debris. It also has a natural ridge vent as well as a more pleasing appearance. No matter where you buy insist on the vertical style roof. 32″ long anchors are inserted through pre-drilled holes in the base rail. A small hole is made in your asphalt and the anchor is driven into the ground with a sledge hammer under the asphalt. Or, if our optional Mobile Home Anchoring system is purchased, a small opening is made to allow for the installation of the anchors. How is my Building anchored to my concrete slab? Holes are drilled into your concrete slab. Then wedge anchors are inserted through pre-drilled holes in the base rail of your Carport, or building into the holes in the concrete and securely fastened. 32″ long anchors are inserted through pre-drilled holes in the base rail. The anchors are driven into the ground with a sledge hammer for a secure hold. If you opt to purchase our Mobile Home Anchoring System an anchor is power drilled into the ground and the base rail is bolted to the anchor.